Today, the established order, the settled view, the whole deck of cards was thrown up into the air and reshuffled. There’s been a few changes to the our leaderboard as well. Heading west today, our destination was Szczecin and, with only two days to go, there's nothing like being lulled into a false sense of security. The end of the rally is fast approaching and yesterday we had a lovely cross country run, a trio of regularities, and an agreeable lunch. Nothing too taxing and, on paper at least, today looked like being pretty much the same. 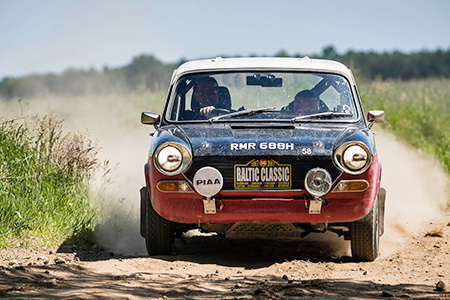 The two regularities of the morning passed without incident, a mixture of short gravel sections and newly laid tarmac around Pomieczyno and Mirachowo took the crews through miles of ancient Pomeranian forests filled with more bug life than an entomologists conference. There followed another idyllic run along tree lined avenues on tarmac which we had all to ourselves. A couple of passage controls in Kolti and Porost kept the rally together and pretty quickly a hungry rally arrived in Czaplinek for lunch. The 48 hour car is now no longer required (as there’s less than 48 hours to go) so the advance crew lent a hand chipping and booking the crews in and out. Andreas Pohl and Robert Peil are back in the hunt with a new head gasket fitted to their Mercedes and, whilst the Morgan of Sharlie Goddard and Suzy Harvey is running they’re taking it very easy. The great challenge of today turned out to be a long regularity on a disused Cold War airfield in Broczyno immediately after lunch. Chris Elkins and Ed Rutherford had raced ahead to secure the site and remove anything which could have given the navigators anything to orient themselves with for this was to prove their sternest test yet. As with most things it looked simple on paper, but faced with acres of empty tarmac apron and a plethora of possible exits and entrances to the next instruction, those unlucky enough to find themselves in the map seat had to be decisive, accurate and instantaneous with their instructions. On a section such as this it was all down to them and their trip meter. The course itself comprised a mixture of near perfect tarmac, horribly broken concrete and perimeter tracks filled with loose sand, judging distance and maintain the correct average speed was tough and, once time had been dropped the vicious equation of more haste equals less speed kicked in. Soon the air was thick with choking dust and blue with the sort of language that only comes when the clock’s ticking and the tripmeter doesn’t match up with the tulip. There were quite clearly some in car relationships which were tested to the limit and, those crews who share any sort of domestic arrangement might be looking to make amends over dinner this evening. 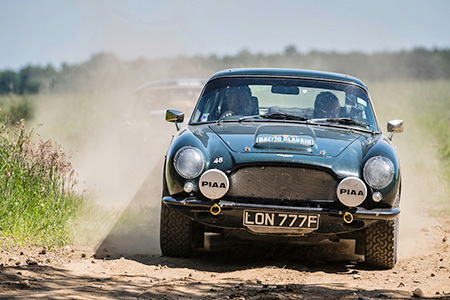 Through the waist high grass, flashes of cars were glimpsed along with the screaming of engines and the squealing of tyres as the rally cars criss crossed the site in sometimes futile attempts to marry up the all important speed and distance conundrum. It was all great fun however and Fredy Niggeler and Mike Gnani enjoyed it so much that they actually did part of it twice. When the crews finally did escape the perimeter fencing and tangle netting and reached the main road there was a simple run into Szczecin, a seaport on the River Oder which will be our final night in Poland but there was a small drama for Ludovic Bois and Julia Colman on the way into the hotel when they suffered a puncture and were seen to be receiving help from a local before Jamie Turner and Bob Harrod arrived. Once the timing chips had been fed into the computer and the results compiled, the full scale of the damage done by the Battle of Broczyno became apparent. Bill Cleyndert and Jacqui Norman are now looking pretty unassailable as first place Vintageant with the Goodwins and Rolners maintaining their second and third places but Andrew and Anne Boland in a Talbot 105 have moved into fourth to break the Bentley stranglehold at the top of the table although the Cricklewood crew still lead the Constructors Championship. The Belgian pairing of Rene Declercq - a commercial pilot - and Eric Claeys, understandably held their nerve on the runway and now lead the Classics category with Gavin and Diana Henderson sadly dropping to second. David and Jo Roberts also did well today and now find themselves sitting in third. Tomorrow there’s a treat for us in Szczecin city centre before our triumphant procession into Berlin. Rest assured there’ll be some crews pushing hard and pressing on. It’s their last chance. Finally we sign off by saying happy birthday to Adrian Hodgson and wishing him many happy returns.